There were chants, chants… and chants, scattered around each corner of Tahrir. The revolution was in check while politics were playing out behind closed doors. It was June 2012, in the few days between the first round of the presidential elections and the following run-offs between the top two. Tahrir was almost full, but rather with a lost soul; the Muslim brotherhoods were chanting for their candidate, who won the first round; the Salafis seemed lost, but still on the side of the Brothers; and revolutionaries had a fleeting sense of a leadership, carrying Hamdeen Sabahi on their shoulders around Tahrir. Sabahi had come in third in the first round, ahead of the other revolutionary candidates. It only took a few days for Sabahi to fade off the radar. Tahrir flowed with revolutionaries’ thirst for leadership and the Brotherhood’s thirst for the plastic crown offered by the military. While walking down Tahrir in a big protest at that time, a youngster with a familiar face came up to me and shook my hand. He gave me the Ultras handshake, so I figured I must have known him, but he noticed confusion lingering on my face. “Don’t you remember? We're both friends of Osama,” he said. “Ah, yeah, I remember. What’s with the bandage? You hurt your head?” I asked him. “They haven’t changed, have they? Damn bad blood, huh?” I said. “Well, the guys and I are bringing some flares tomorrow night. They’ll see who we are then,” he replied. It took me a minute, but I started to recall hanging out with him. It must have been that last time I bumped into Osama in Tahrir, just over three months ago. He was there with him and we sang and danced, the three of us, to some Ultras song on the big speakers in Tahrir. Osama was with the other Ultras boys that night, protecting the stage. The Ultras had prevented Salafis from taking over the stage and the surrounding area, and they offered it up for the use of all the revolutionary forces. I can’t remember that night hanging with Osama and the youngster back in May 2012 without thinking of what came only days later: the Al-Abbasiya clashes with the military. On one of their bloodiest days, I had spent the night in, writing. I was in a confused place about the clashes. The circumstances were confusing, and the crowds in Tahrir were dominated by Salafis, who had only appeared once or twice before over the past year-and-a-half. When they did turn up, it was mainly to show some muscle by taking over the square on a big Friday protest. They have never been the regular troops on the front line of the clashes. During Abbasiya, they showed up and surrounded the ministry of defense, talking about breaking into it all the sudden. Abbasiya, with its narrow streets and almost no easy exits, was a certain death trap. We’d already had an experience there almost one year prior, when a march on the ministry was cornered for a whole day, marchers unable to find a way out. Even the mosque was blocked then, and the Sheikh had to get on the microphone, screaming hysterically, in tears, for God to save Egyptian blood. Many were injured, and one guy was killed as a rain of stones descended upon his head. It'd been a year, and the Salafis seemed strangely unconcerned about the dangers of the area, not sharing our wariness. On one of the nights of those Salafi-led clashes at Abbasiya, though, I knew instictively that Osama and the Ultras boys would be down there anyway. They never miss a fight. Scrolling now through Facebook newsfeeds, I came across a picture posted by Ramy Essam. It was a picture of Osama on that Friday, right before the clashes, on the stage in Tahrir, singing and dancing to Ramy’s live music, shoulder to shoulder with Ramy. The other small picture attached on the lower right side of the page was of Osama’s head, lying on a white metal trolley with a bloody hallow around it. That’s how I learned of Osama’s death. Now, in Tahrir, I looked back at the youngster’s face and told him I was thinking of writing about Osama. I admitted that I only knew Osama through Tahrir, so I never knew his last name or where he lived, nor what he studied or did for living. As I talked, I saw the youngster’s eyes cloud over, traveling to another place. He took his time to reply. “Well, Osama lived in Helwan, where I live. We used to take the subway together every night back from Tahrir,” he said. “I think he worked as a tourist guide.” The youngster trailed off. He brought me, then, to the corner in Tahrir where they used to hang out, he and Osama. When we got there, he pointed out Osama’s parents and sister, sitting near the very same corner. They were hiding behind a big metal traffic barrier. I greeted Osama’s sister. She had Osama’s eyes and such a smile! Looking at her smiling that way, I felt ashamed of the tears in my eyes. Osama’s father, in his poor galabeya, and his mother, in her poor khemar, looked like a pair of people with nothing in the world but their kids. I kept listening to Osama’s father, looking at him, and memories just kept babbling up in my head. What is life for then? And what is revolution for? Even in revolution, we, at some point, come up against an end, and never really become complete. No matter how persistent one is, or how much he has become one with the revolution, one can just become a character whose role ends mid-story. And without him, the story continues on. If revolution doesn’t get us to transcend time, then what’s the difference? Osama’s biggest thrill, his and his Ultras friends, was to revel in their stories – stories fueled by myth and exaggeration. Among themselves, they’d never exchange stories about their lives, families or studies. They’d only talk of the revolution; that’s where they could share the only self they had, and the square the only home in which they could rebel against their (typically) old-regime-head fathers (workers in most cases). They’d walk a thin line with God – neither less, nor more. And life, to them, had started just five years ago: in the stadium standing up to the oppression of the police. And it’s been ending in Tahrir’s revolution, where endings only give rebirth. Each of them had a friend – one friend, at least – who died in his hands or arms, or took a bullet for him. On the first of February, during the Ultras’ massacre, Moataz had to crawl over the crumbled mass of screaming faces and dead, bloody bodies of his own friends to break out of the sealed metal gates of Port Said stadium. The only friends they talk of are their buddies who got killed. In many neighborhoods across the country, streets might look like cemeteries, with all the names and photos of the martyrs painted on the walls or hung on doors and shops. And the numbers keep growing. Naturally, girls, romance and rave parties in the small streets always find a place as well, spinning somewhere in the middle. Some might say: We’re all activists, just in different roles. What I think about that is: Osama, my friend, never “tweeted” about how “the beach” was. He was a man missing mentoring his only son. “How do you feel about the thousands of people protesting here tonight?” I asked. I keep wondering to myself. What happens to revolutionaries? Where do they go? They keep on living, doing things, with the occasional comfort of a nostalgic talk or sharing thoughts with few friends. Talks that fly into thin air. But at some point, they inevitably stop making revolution. I’ve spent many days interviewing people who were in their 20’s during the 1970’s uprising – an uprising, as it were, that never was completed, its history written by the very president who suppressed it, writing it off as “The uprising of thugs!” No wonder. But what is a complete revolution after all? I think revolution becomes personal to each of us, thus one lets himself get taken away by life at some point. I could picture myself hitting that note. The revolution switches from being a part of one’s consciousness and emotions to being a part of the whole of you: “Your existence becomes an act of revolt in itself.” I read that line somewhere. Maybe the only thing that can deliver me to a sense of calm about Osama is coming to terms with the fact that we’ve only known one another through the revolution, so my revolution got the chance to look out, momentarily, through his eyes, and his had the same chance to gaze a moment through mine. With the bullet Osama took for our friend Ramy Essam, my revolution would never get the chance again to look out again through his vantage. I have to live with the fact that our revolutions have just gone down separate paths. Now I feel I have new perspectives and walks to take regarding the revolution, as it and I continue forward. Maybe I’ll go through my notes from the past year-and-a-half and re-read them, filling in the gaps with whatever I still remember. I’ll try to find my corner again, my view within the revolution. Maybe I’ll come upon it tomorrow, or maybe in another 30 years. Either way, I’ll keep it alive in my heart by doing just one more act for it. Maybe there’s now a bigger urge for this. "The truth of revolution is the ecstasy that never shows a way, and neither sends you away. It's a faith that its path will never let you lose hope, nor let you lose the confusion. That's the faith that we revolutionaries need. Others don't. Some people might call us ignorant, radical, or they might just wave us away, advising us to grow up. I say we actually are radical: A revolutionary never takes half-answers. That's what separates revolution and defeat. We might be ignorant of what's behind the hill, but we just know we hate that goddamn hill! With revolution, time and space become meaningless, thus we just never age. If these words of mine come across, then know the revolution is well." Amor Eletrebi is a 24-year old poet and activist who has been participating in Egypt's revolution throughout the past year. 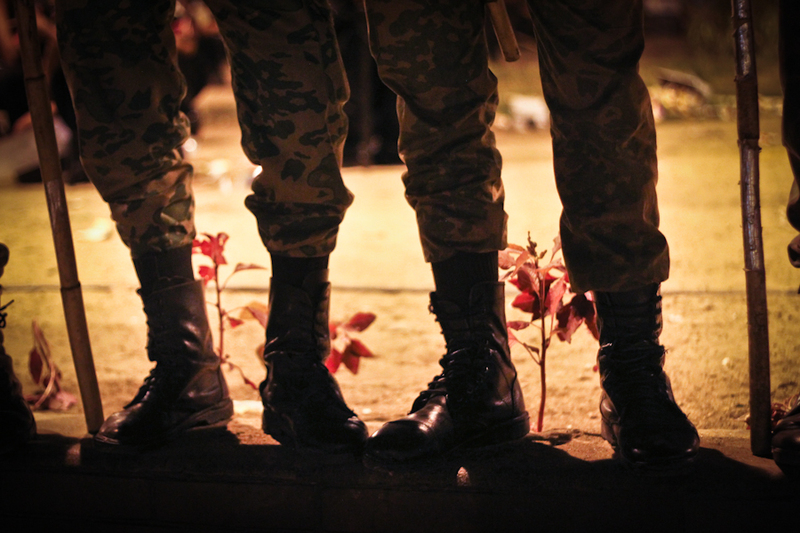 The photo of soldiers guarding the roundabout garden in Tahrir Square appears courtesy of Mosa'ab Elshami.